(Quincy, MA) - NAGE National President David J. Holway spent the morning of Sunday, February 7th, 2016 visiting Nut Island Treatment Plant in Quincy, Massachusetts where an explosion occurred two weeks earlier. 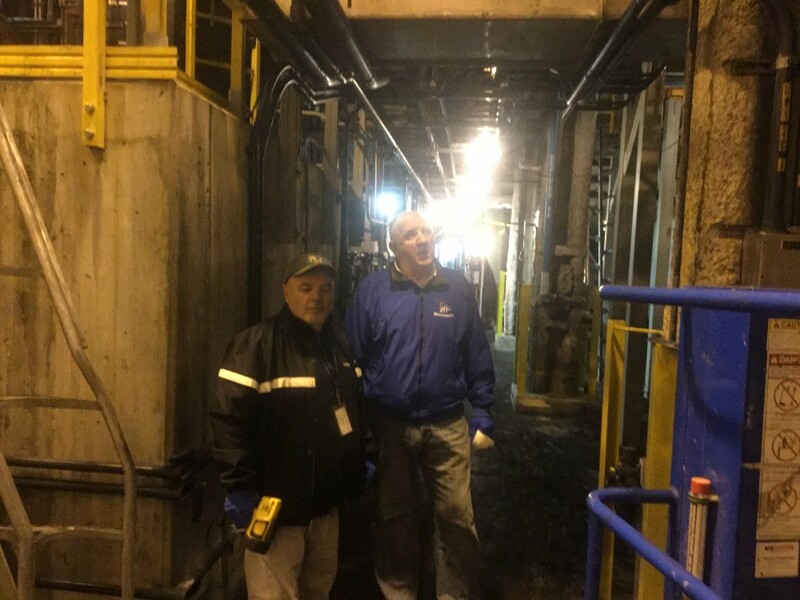 President Holway and National Representative Tom Flynn were led five stories underground to the odor control area of the plant by NAGE Local 168 President Bill Lane. They reviewed the damaged equipment where the fire occurred and the area where five employees sustained serious injuries during the event. These employees were later hospitalized but have since been released and are in recovery. While the injured employees recover and the damaged equipment is repaired, NAGE leaders and others are wondering what action can be taken to prevent similar events in the future. National President David Holway and Local 168 President Bill Lane review equipment damaged by fire at MWRA Treatment Plant in Quincy, MA.